Vol. 4 no. 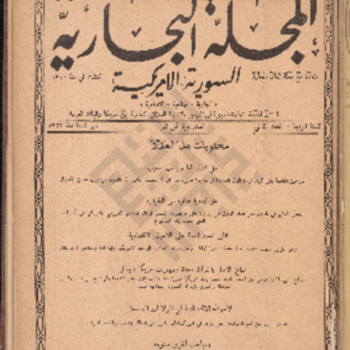 2 of al-Majalla al-Tijarriya contains assessments on the impact of World War I on global economics, including an article on the topic by banker and journalist Frank A. Vanderlip; a consideration of economics in Central America; and a general review of economic conditions in the United States. Donor retains full ownership of any and all copyright currently controlled in agreement with Khayrallah Center. Nonexclusive right to authorize all uses of these materials for non-commercial research, scholarly, or other educational purposes are granted to Khayrallah Center pursuant to Creative Commons Attribution-NonCommercial-ShareAlike (CC BY-NC-SA). Salloum A. Mokarzel and Syrian-American Press, “Syrian-American Commercial Magazine Vol. 4 No. 2,” Moise A. Khayrallah Center for Lebanese Diaspora Studies Archive, accessed April 20, 2019, https://lebanesestudies.omeka.chass.ncsu.edu/items/show/13954.